He recorded his first album, Infiniheart, in his bedroom, where he not only played all the instruments, but made most of them himself. It took him six years. This August he released his second album, Skelliconnection, which he recorded this time in his basement. 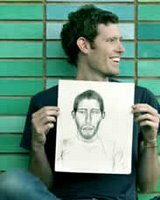 Chad Vangaalen is an odd and lovely musician. His music is full of sound bits and strange instrumentation and his distinctive voice is a quavering soaring falsetto, often reminiscent of Neil Young, but much, much weirder. I first became really aware of his music when he toured with the Constantines this spring. He was irreverent and strange, telling poop stories and weaving disturbing and beautiful worlds with his unusual songs and unique vocals. He's a graduate of the Alberta College of Art and Design, where he once, on a dare, pooped into a hot dog bun, decorated it with plastic eyeballs, encased it in a plastic box and displayed it in a gallery. He was quite disturbed when it was eventually stolen. Chad says, "who knows where it is now? It's probably on eBay now. Where are you little guy?" His art leans toward the eyeballs on tentacles school, and his videos are a strange ride featuring his animated artwork morphing from one weird world to another. I thought that the Hallowe'en season would be the perfect time to showcase this unusual and talented local boy, who plans to build a skateboard park in the backyard of his newly purchased Calgary bungalow. This first song, Graveyard, is from Skelliconnection, his new cd, and is a classic, sad and lovely ghost story. The second song, Blood Machine, from his debut Infiniheart, is not so much what you would consider to be a Hallowe'en song, but I find it much more terrifiying, the beautiful and mournful tale of an underground society held slave by a giant machine. 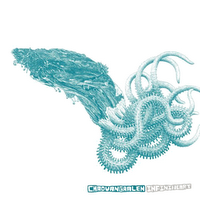 You scared me a bit when you said weirder than Neil Young (I was thinking vocally) but wow, does Mr. Vangaalen have a beautiful voice and his lyrics draw you in. I especially enjoyed Blood Machine, I'm a sucker for the lyrics 'please, please' in any context. Also, interesting use of instruments near the end. i wish i had the ear to pick them all out. On the poop hot dog bun stealing front....it amazes me what people will steal, and also reminds me that you should watch Art School Confidential. It kinda has a creepy Halloween vibe, but then again I think John Malkovich is a little off no matter his brillance. Ooops, I guess I wasn't too clear on that front, Allison. He does have a heartbreakingly lovely voice, doesn't he? I never tire of listening to Blood Machine, it's an entire film or novel in a song, without it really going into too many details. I have been wanting to see Art School Confidential; this clinches it. John Malkovich was a creepy old man when he was still young! Aw, he's such a qt! I am sitting at work right now in a Mrs. Thurston Howl the 3rd costume typing with long gloves on. Oh well, the people on the subway had a good laugh. I found out last minute I was not getting a lift in to work and had to wear this in public. Are you guys wearing costumes at work? After your resume for him I was expecting something completely oddball, but his music is very tempered Indie Folk. The sweet tone belies some dark words. Who, pray tell, is Mrs Thurston Howl the 3rd, Barbara W? Sounds intriguing. I am dressing up at work this year, oddly enough for the first time. I shall be a zombie, of course (and they're easy, as long as you have a plaid shirt, because you will notice that zombies often wear plaid). Those were actually some of his less odd songs, Ben (but a couple of my favourites). Someday I'll post some weirder ones. I am SO jealous, you guys do Hallowe-en so much better than we do! Dressing up for work and everything! Everybody loves a zombie! Though I doubt anyone would notice if I dressed up for work. I'm at work currently and therefore can't hear these exciting songs. He sounds GREAT though! Pooping in a hotdog bun, what a hero! Looking forward to a listen when I get home. Giligans Island... you know, Lovey. Everyone at work is giggling at me.. I took a cell pic and I have to laugh at me too. Take a pic ofyou in your zombie outfit and email it to me. I was taking to that reporter we talked about and I was thinking to myself "you have no idea how bizarre I look right now..."
I gotta hand it to anyone so cool as to build a skatepark in their backyard. And he's from Alberta? Dude. Yeah, I agree with Ben... very indie folk. Nice morning music, especially for dark introspection over a cruller. Happy Hallowe'en (did I spell it right?) doll! Eat lots of candy & spike that punch heartily! Oh oh, I guess I shouldn't be eating my lunch while reading blogs *giggle* poop on a bun num num num LMAO! Sounds like a real interesting character :) I will have to listen to the files later as Im at a health unit right now. Tho, if you ask me, they could definitly use some music around here. Im feeling mighty droopy after being here for 5 hours. Booooorring! You have a rather odd criterion for heroism, Kees. But yes, some of us around here take Hallow'en pretty seriously, We even had a Hallowe'en potluck at lunch today and it was a beautiful thing. We have people from so many different cultures here that our potlucks are absolutely amazing. More than made up for the fact that nobody gave me any candy this morning. He was probably dressed as Dr Frankenfurter, and thinking the same thing as you, Barbara W. I shall post some photos on the blog tonight. Did you have many people dress up at work? Dark introspection over a cruller - that sounds like the title of a Douglas Coupland novel, Michelle. Eva's not going out for Hallowe'en this year and I just realized the only candy we'll be getting is what we already have. Where's the fun in that? Oh yeah, scaring the bejeebers out of little pirates and butterflies. Have a good one yourself, sweets. Yeah, poop on a bum may be high art, but not the best lunch conversation, Mel. You know that if they were to play music at work, chances are it wouldn't be anything you would want to hear. I'm actually having a really good Hallowe'en, due to massive injections of food. Anybody going out trick or treating at your house tonight? That last song sounds like something from Well's The Time Machine. Creepy. "Where are you little guy?" i am so glad you posted this. Chad Vangaalen has been on my list of artists to check out. i have a cd with one song by him (it's that double cd from the university radio station.. is it cjsw? i feel too lazy to look it up) and i've always meant to look at him more indepth. It does sound something very much like that, doesn't it, Leazwell? Very eery. He has another song about a car crash that's also unsettling. He's worried about his poop! How can you not love a guy like that, JACC? Yes, cjsw - the 20 year anniversary cd, 668? Is it any good? I've meant to check that out myself. I'm more than glad to help by showcasing local folks, especially interesting personalities. Boys! Eva and I are dressed like zombies and she's handing out candy, because I think I'm going blind from the makeup I'm wearing around my eyes. I saw a video of his on Much Music's "Going Coastal" the other night. I really liked the song and video, sort of a psychadelic cartoon, but I missed the name. It was a faster tune than the ones you posted and "Traffic". Any idea which one I'm talking about? As a matter of fact, I saw it too, John. The song was called Flower Gardens and it's on Skelliconnection. I love the fact that he does his own art for his videos. Thanks, you're a wealth of musical knowledge! yah, that's the cd! i enjoyed it. i love buying cds by local bands when i travel. Oh pshaw, John, I just happened to see Going Coastal.. but thanks. What better souvenir of a place, 668? That's a fantastic idea. Yes, we zombies must suffer for our beauty. That "Blood Machine" song is absolutely amazing. Thanks for pointing me in its direction. It tells a pretty amazing story, doesn't it, Will, as well as being lovely.